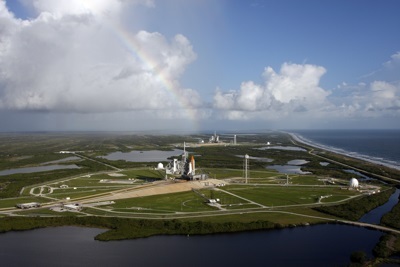 Located just to the North of the city of Cape Canaveral, Florida, the Kennedy Space Center is the NASA launch facility (spaceport), and has been used for the Mercury, Gemini, Apollo and Space Shuttle programs. The Kennedy Space Center features a Visitor Complex, which is home to museums, two IMAX theaters, bus tours allowing visitors to see restricted areas, and a bus tour to an observation gantry in Launch complex 39. Visitors can relive parts of the Apollo program, see a restored Saturn V launch vehicle, visit the Astronaut Memorial (honoring the astronauts who died in the line of duty), see used space craft including a Gemini capsule and Apollo command module, and visit the Explorer - a replica space shuttle.